A pool is a major investment. Not only does it take money, but a pool will also require your time, yard, and your energy. Having a pool build in Houston may seem overwhelming at first, with the plethora of options and decisions to be made. Here, we have put together some things to keep in mind when building a custom pool. Just how much pool can I afford? Do I have any zoning issues to overcome? Where can I learn about pool safety? Who should install my pool, and how long will it take? The size of your pool is primarily a personal choice, and often dictated by the size of your yard. In Houston, pool builders often are asked to fill the entire available space with a pool and patio, replacing all the grass in a yard. While this is a great way to build the perfect outdoor living space for you and your family (by including a fire pit, outdoor kitchen, and a spa/hot tub), you will need to make sure that your pool builder has the latest zoning laws to review. 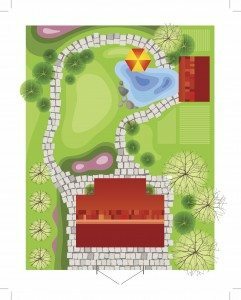 Zoning laws typically cover things like required fencing, pool depth requirements for slides and diving boards, easements and set-backs, and more. Your pool builders can tell you more. Of course, we at Richard’s would like you to choose us to build your custom pool. Come on in and meet with us, discuss your project. We’re sure you’ll like us so much that you’ll choose us as your custom pool builder. Call us at 713-777-7665 (POOL) to schedule an appointment. This is one of the largest variables in the entire process of building your custom pool. Depending on the size, design and options you choose, your custom pool can take anywhere from three to twelve weeks (sometimes more!) to build. Safety should be the number one concern for pool and spa owners. With the proper enclosures and supervision at all times, the safety of children, pets and wildlife can be greatly increased. There are many specialty safety products on the market, including safety covers, life jackets, pool floats, and more. Ask us about the selection available. Homeowners insurance covers the liability on your swimming pool. Some insurance companies will raise premiums for owning a pool; speak with your insurance agent prior to building your pool for details. My wife and I bought our pool from Richards a couple years ago and are still even 3 years later remembering why we are so thankful we went with them and not “the other guys”. They are always so friendly and helpful whenever we come in, and are the only ones we go to when we need anything for our backyard, which is absolutely BEAUTIFUL!!!! !